So far in the SHL’s minor league, the competitors have been pretty well matched. Most of the teams are within a game or two of the .500 mark. There are a couple of exceptions, however. In particular, there’s one team that stands head and shoulders above the rest: the Virginia Rhinos. 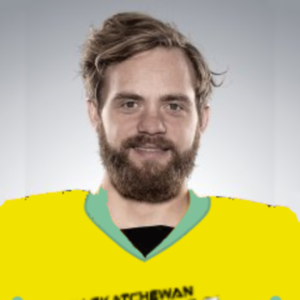 The affiliate of the Saskatchewan Shockers is threatening to run away with the league. At risk of throwing away his career, Stickel devoted the offseason to getting himself back on track. He went to an alcohol treatment program and swore off drinking. He also spent countless hours refining his craft, studying tape to identify the flaws in his game and working with coaches and ex-teammates to correct them. The results have been evident: this season, Stickel has gone 14-4-1 with a 2.20 GAA and a .927 save percentage. Stickel’s solid goaltending seals up the defensive end for the Rhinos. On the offensive end, they benefit from a potent and varied offense. Their top line features two of the CHL’s top scorers, LW Yuri Laronov (11 goals, 28 points) and RW Colton Jabril (12 goals, 29 points), flanking one of the best passers, C Tanner Brooks (24 assists). Coach Jeffrey “Swampy” Marsh likes to activate his defensemen on the attack, and the results have been evident. Blake Blacklett is the CHL’s premier offensive defenseman (12 goals, 26 points), and Virginia has a couple other strong two-way threats in Robby Rohrman (9 goals, 21 points) and Rennie Cox (8 goals, 19 points). Posted on June 25, 2017 June 28, 2017 by patriotlgPosted in Minor League UpdateTagged barney flintridge, blake blacklett, colton jabril, jeffrey marsh, rennie cox, robby rohrman, shawn stickel, tanner brooks, virginia rhinos, yuri laronov.